Great! I didn’t know how to get the ext-gui to work. You gave the answer. Thanks. A similar project is my DIY midi piano with 4x mpr121 touch sensors. 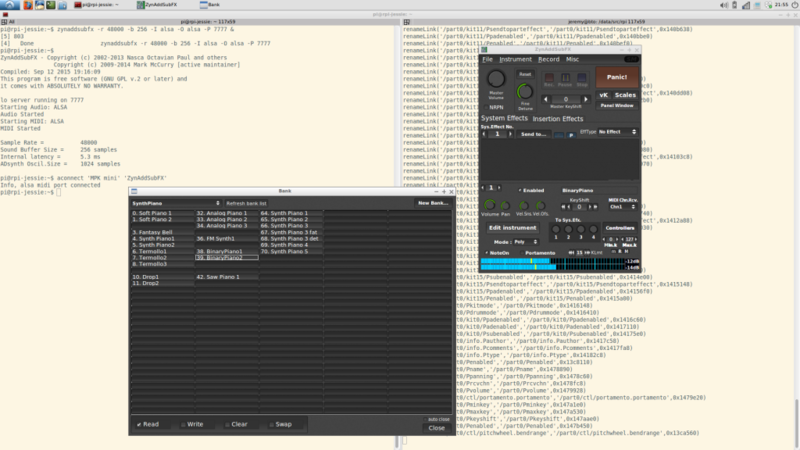 Since now I controlled the osc commands with oscprompt which gives you the same access to the rich featured zynaddsubfx. The platform is an Odroid-C1+ with HiFi shield. It is running smoothly even with X enabled and controlled via remote desktop (vnc). But tomorrow I’ll test it headless with ext-gui and hope it will perfom even better without any glitches. Tested it. GREAT! You can use it vice versa. So maybe I’ll use the little Odroid-C1+ only as thin client with zynaddsubfx-ext-gui to control the big machines. Do you know if there are plans to develop something osc and zyn related for android? Hi Georg, as far as I know there are no plans for developing a remote ZynAddSubFX Android client. Great idea though, it would be awesome to control ZynAddSubFX with a tablet over WiFi. found a solution for that already . It is possible to control the zyn with TouchDaw for Android (available on G*PLAY). It has OSC on board. Open the keyboard and there klick in th left upper corner (on some stripes). Klick on “Program/Bank changes” and back in the keyboard on prog+ to change instruments. It works perfectly, but you have to know the bank/prog numbers by heart (oooouuuf) or print them out. Didn’t think about that! That’s just super nice, to be able to control a headless instance of ZynAddSubFX from your tablet.